A roundabout is an intersection with an island at its centre. When in a roundabout, you must always keep to the left of the centre island. 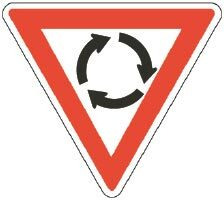 Roundabouts will be marked with a Roundabout sign and can either be single-lane or multi-lane roundabouts. if you intend to go straight on, you do not need to give a change of direction signal as you approach. signal (left or right) if you intend turning at the roundabout. On a multi-lane roundabout, lane arrows and signs will tell you which lane to use, depending on where you want to exit the roundabout. As a general rule, if you want to take the first exit on the left, you must choose the left lane (Example 44). If you want to go straight on, you can use either lane (Example 45), and if you want to turn right - leaving from the third or any subsequent exits you must chose the right-hand lane (Examples 46 and 47), always remembering to give a change of direction signal. You must also choose the right-hand lane if you want to go all the way round and return the way you came. You must Give Way to vehicles already in the roundabout. You should also take particular care of vehicles approaching or about to enter from your right because they may enter the roundabout before you. Pedestrians or bicycle riders crossing an exit road at a roundabout must give way to any vehicle or bicycle rider entering or exiting a roundabout. At all times, you should signal with your indicators to let other drivers know your intentions. Immediately before leaving the roundabout (i.e. when passing the exit before your exit) you must signal with your left indicator, unless it is impracticable to do so. For example, the roundabout may be too small to allow your indicator to operate. This tells drivers waiting to enter the roundabout where you intend to exit. 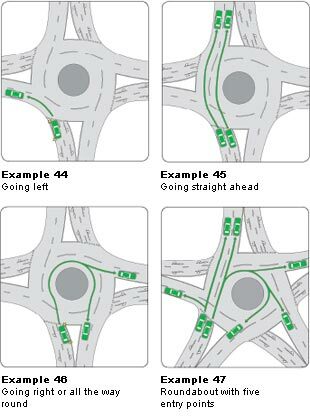 Example 44 - if you're turning left, approach in the left lane and give a change of direction signal to the left. Stay in the left lane and turn left. Example 45 - if you're going straight ahead, use either lane (unless the arrows indicate otherwise). You do not need to give a change of direction signal when approaching or entering the roundabout but should give a change of direction signal to the left, if practicable, immediately before you reach your exit and leave the roundabout. Example 47 - at a roundabout with five or more entry points you must obey the lane arrows and signs. Bicycle riders are permitted to turn right from the far left lane on a multi-lane roundabout provided they give way to any vehicle exiting the roundabout. Drivers must remember to look out for those bicycle riders stopped in the left lane who are giving way to exiting vehicles.